Known for his large, elaborately cast ceramic sculptures, which refer to the design vocabulary of modernistic interior architecture, Cristian Andersen (*1974) surprises with his new works Miles Ahead (2018) in his presentation at BolteLang. They transform the material concrete into an image carrier for painterly bizarre aesthetically sophisticated compositions. The computer generated, digital images are printed onto cast, sheathed concrete panels with a UV printing method. Using the artistic means of Photoshop, deliberately amateurish figurations are joined with pre-existing, high resolution, photographic elements, and mistakes purposely included. During the casting process circular notches are produced and subsequently filled with colourfully air-brushed acrylic glass. This creates exciting vistas. Cristian Andersen manages to confuse the viewer’s perception. The disassociation is emphasised by the depth effect of individual motifs with accentuated shadows and the optical illusion referring to pop aesthetics such as the floating coloured sequins. The experience of the ‘digital’ surface is remindful of the omnipresent screen aesthetic of our everyday world and accentuates a contemporary image vocabulary. The sculpture Puffs of smoke in the room (2017) reminiscent of clichés of modernist interior architecture completes the presentation. The piece made of concrete, metal elements and upholstery belts reminds of items of furniture and reference furnishings of a defined architectural era. Complex and elaborate work processes underlie Cristian Andersen’s pieces, a play with material and contrasts, which sways between rough concrete and smooth surface. 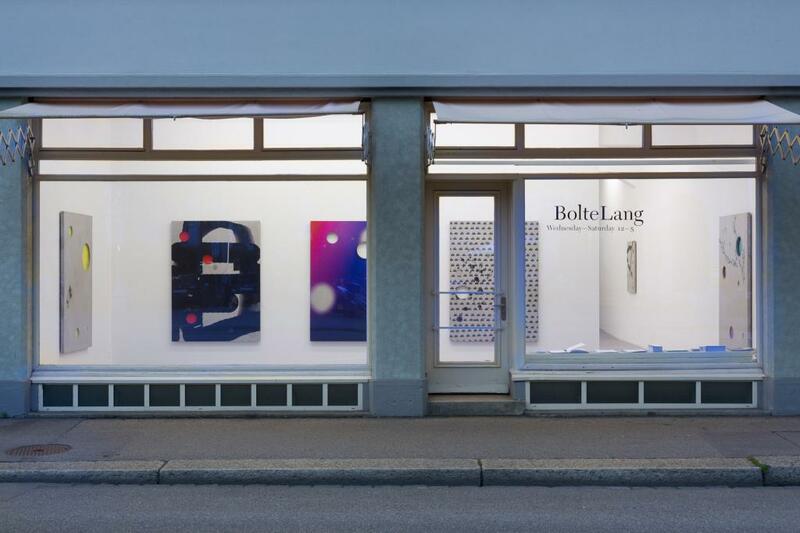 After the brilliant exhibition True Blue (2016) at Kunstmuseum St. Gallen Loredana Sperini (*1970) present new work groups at BolteLang, which are arranged in an interior like setting. The staging reminding of an ameublement includes a table, chair, shelf and several small sculptures. These are characterized by amorphous, figurative and abstract shapes. The sculptures are made of wax, ceramic, cement, or cast in bronze, and illustrate the experimental, inquiring treatment of most diverse materials and material combinations. The fragmental points to things past, and destroyed, but also incomplete, and sketched. In her sculptures colour pigment and fine crystalline wax combine with the resistant building material cement and become intriguingly colourful compositions, which unite geometric and figurative form language. The new textile collages applied to classic, square handkerchiefs come as a surprise. Concrete and abstract pattern variations, which occasionally present painterly qualities, epitomise symbolic and dreamlike motifs. Loredana Sperini finds counterparts or symbols in the immediate present, which make an authentic and direct sensory experience possible for her. At the core lie the search and discovery of very personal and poetic, corporeal and body-related works. Loredana Sperini’s work processes are experimental, technically highly demanding in their implementation with the surprising result of particular aesthetic allure. Her pictorial language, sometimes remindful of the grotesque, oscillates between abstraction and concreteness, sounds essential themes in art such as corporeality and mortality, and hence develops a fundamental content level.